I simply replied “I’m fine, thanks”. A mask is what we choose to show others and it hides from them – and ourselves – what we’re really feeling. We all have to maintain some kind of professional mask in our jobs as it’s usually inappropriate to behave at work the way we do with friends or loved ones. But what about in other areas of our lives? When do we reply “I’m fine, thanks” when, in reality, we feel the opposite? When do we risk dropping the mask and talking honestly about how we feel? Wearing a mask generally isn’t about deception; it’s about protection. We can learn to put masks on very early in life in response to our experiences, particularly negative ones. A mask is what we choose to show others and it hides from them – and ourselves – what we’re really feeling. 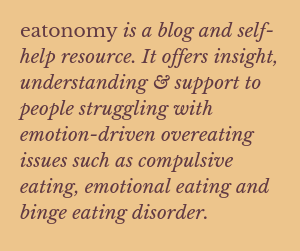 People whose eating is emotion-driven often feel that they’re not allowed to show what they’re really feeling, especially if they’re struggling, and this can contribute to a sense of isolation. Food becomes a way not only to suppress difficult feelings but to compensate for a lack of support. So what are some typical masks and what might really be going on when people say “I’m fine”? Of course, there are times when it’s appropriate to put on a brave face or lighten the proceedings with a joke. It just becomes an issue when we do it all the time. “But I can’t tell people what I’m really feeling because I don’t want to burden them”, you might say. As human beings, we long for genuine engagement with others. You hate the thought of being one of those people who constantly moans and takes no personal responsibility for their issues. But there’s a pretty big halfway house between saying absolutely nothing and delivering an extended monologue about all your complaints with no empathy for the person on the receiving end. Because what’s the cost to us of continually hiding behind a mask? The cost is we miss out on meaningful connections with other people. As human beings, we long for genuine engagement with others, it enriches our lives and eases our loneliness. But if you’re always wearing a mask, people aren’t really meeting you – they’re meeting The Mask. In taking the risk to drop The Mask and reveal a little of our vulnerability, we allow people to really meet us. More than that, we give them permission to do the same. I was partly inspired to write about this topic by a post I read last year from fellow blogger Devoted and Divorced, entitled “Valley Walking: Living Inside Out” (click on the title for a link to her post). In it, she beautifully articulates how she simply couldn’t maintain any kind of mask following her divorce, and instead had to allow herself to be “stranded, exposed and vulnerable”. The result surprised her and it may well surprise you too. It’s a stunning piece of writing which I would encourage everyone to read. “What Mask Do You Wear” is the topic for the next eatonomy group session. For details about the group please go to the Community page. Often there’s a desire to protect others from potential upset if we talk about what we’re really feeling, but it comes at such a cost. Many thanks for your comment, Lol. This is a very interesting article, Julie. When people ask how I’m doing, I simply tell them I’m fine, even when I know I’m not. I do this mostly because I know everyone goes through problems at some point in time, and so my case isn’t really special. I also do this because there was this one time when I trusted someone with the challenges I was facing, and later on, that someone used that information to hurt me. She betrayed my trust. I think most people wear masks and don’t talk about their problems because they’re scared that people might criticise them, make them feel bad about themselves, or use it against them later in future. Hi Obinna, I’m so sorry to hear about your experience and how badly you were let down by someone you trusted. It’s so painful when that happens that often it puts us off risking being vulnerable with anyone else – as you say, we’re scared that we’ll be criticised or betrayed. But there are people out there who are trustworthy with our feelings. Thank you so much for your comment and for sharing your experience – I think it will resonate with many people. PS Many thanks for your second comment letting me know you’d had trouble posting your comment – but I did get it! I don’t know why it said “couldn’t post comment”. I don’t know about you but I’ve had a few issues with WordPress this evening – lots of glitches when I was trying to publish my post. Yes, yes, me, too. I had a lot of a trouble with WordPress that day. I’m sorry about the duplicate comments. What a wonderful post, Julie. Thank you for sharing. I couldn’t agree more with what you say about the cost of constantly wearing a mask, and it’s an enormous one. You make a really interesting and thought-provoking comment about how when we drop The Mask and let others really meet us, we allow them to do the same. I hadn’t really thought about that before – the impact of not being authentic on others – as I always thought about the negative effects of inauthenticity only in terms of myself. But I think it’s true – we can all instinctively sense when others are ‘hiding’ from us, and when they’re letting their true selves shine through. How many times have we come away from an encounter and had a nagging feeling that something just wasn’t quite right, that the other person somehow seemed false, that everything was just a bit stiff or contrived. When we start sensing that the other person is clamming up, we follow suit, and I suppose everyone is then stuck behind a facade of inauthenticity! It’s exactly that, isn’t it, when you meet someone but have that sense that you’re not really connecting to them because there’s something in the way? I do think that sometimes it can start a kind of chain reaction if we risk talking about how we really feel – as you say, others can begin to follow suit. Obviously, we’re not going to risk being vulnerable with everyone but I feel it’s important that we have people in our lives that we can be truly ourselves with. Really good to hear your thoughts, Lisa, thank you. Thank you for this! I wear a mask so my husband won’t get upset. I wear a mask so the family doesn’t get concerned but in my weekly support group…..it gets put away. I’m with other caretakers and families who are living and dealing with the same exact things. I feel “safe” to do so with them. No one would dare criticize! Lol! Many times though, I just answer with, “I’m fine” because I feel the other person doesn’t need to feel my burden or it’s just not their concern. For example, I rarely blog about what dementia caused my husband to do yesterday. Why complain about something and have him read it? AND no one here at WordPress cares to read it either lol. It also doesn’t change his disease. Wearing a mask at times, at least for me, means protecting my husband. I can privately not wear it with those who I feel the safest. Also, I was raised where one doesn’t air their dirty laundry. My blog walks that fine line and sometimes crosses it but generally speaking, I won’t write about the bad day my husband had. The mask serves a huge purpose in some cases. What is it my grandmother used to say? There’s the public side of you and the private. Not everyone needs to know your business. Great post Julie! Hi Erin, I was really moved reading your comment as you’ve given us just a hint of what life is like for you and your husband – it must be so challenging. I’m glad to hear that you have a support group where you’re able to talk about everything that’s going on. This is exactly what I’m talking about it in the post – it’s not always safe or appropriate for us to tell people really how we feel, but it’s important that we have a space to do that somewhere in our lives. I have to agree with your grandmother – I don’t think everyone needs to know our business but it certainly benefits us to have people we can allow ourselves to be vulnerable with. Thank you so much for your comment and sharing your experience. Right on all accounts. We do wear masks for a variety of reasons, the most common one is that most people who ask us how we are doing, are not the least bit interested in hearing about it. That sounds so sad, Sadje! I’m sorry if that’s your experience. Many thanks for your comment. I don’t feel sad over it, but I keep the details for those who really want to know. Otherwise a care free greeting and all is well deserved, works for them. Exactly – I think there’s some middle ground between denying our experience (“I’m fine”) and spilling our guts to all and sundry. I really like your phrase “let them in a little”. Obviously, it’s important for us to consider who we allow in but I think with people we trust it’s OK to show them what we’re really feeling sometimes. I notice in your recent post, “It’s Time to Talk…Mental Health 2019”, you describe how you risked opening up to someone when you were younger and how you were so hurt by their betrayal. Rather than allowing this to diminish you forever, it seems to have fuelled your desire to speak up which is truly inspirational. Thank you for your comment, Caz, I really appreciate you adding to the conversation. “…hidden only God knows where”, I believe it goes. That’s a great quote, very intriguing – many thanks, Dutch. Great post Julie, l used to wear a wall of masks, but haven’t worn masks for about five years now. I had to wear them to fit in to my peer groups and society due to to my Asperger’s – but Suze and l made a pact and that was to no longer wear any which l don’t do. Of course this does leave me open at times, but if that is the case, then so be it, at least l am finally being me and if people don’t like me unmasked, well that funny looking thing over there in the wall is the door, please shut it on the way out is my response to people these days. Unmasked people can come across as direct, abrupt and downright rude and it isn’t that way at all – it’s simpler than that – we no longer live in a world of cover ups and we no longer pretend to be something we are not. I think we can strive for authenticity whilst still having empathy for others, can’t we? I love that you and Suze made a pact to drop the masks – honesty is so important in any relationship. Many thanks for sharing your experience, Rory.